Why does David love skiing? Love the feeling of glory when winning races, but love feeling the flow going down the slopes when it's just you and the mountain. Best ski for your pow day or shredding turns on the sunny colorado slopes. Awesome ski to rip GS turns on groomers. Yet 98 mm under your foot will keep you floating through the powder. The complete all mountain ski. Race boot performance with all the comfort and forgiveness you need. Great boot for all skill levels, built to more easily drive and control your fat boards. Great goggle with wide, no distortion field of view for great visibility. My shred slalom helmet at over 50% off! Lightweight, but heavy-duty binding whether you are touring in the backcountry or on the groomed slopes. Ski or walk around town in style. Sure enough to keep you warm when the bottom drops off the thermometer. Waterproof jacket to protect you from the elements. Love these socks! Warm yet thin and light to fit inside the tightest of ski boots. Shinguards that will protect you from your assault in the slalom course for you slalomers like me! Got to show yourself off! Amazing, moving film celebrating the life and journey of Shane McConkey, one skiings' greatest and most influential athletes. Multiple time NCAA champion, U.S. champion and 2014 Olympian David Chodounsky knows a thing or two about skiing and appropriate skiwear. With what seems like an entire wardrobe of ski gear, ski helmets, ski goggles and and boots, musicians would refer to him as a “gear head”. With something for just about any situation on the slopes, let’s take a look at his gear selection. David is a Nordica loyalist and sticks to their skis and boots while the same can be said about Shred with his ski helmet and goggle combination. Much like his Olympic counterpart Andrew Weibrecht, David trusts Shred, Ted Ligety’s Company with head safety and Spyder with warmth and comfortable outerwear. 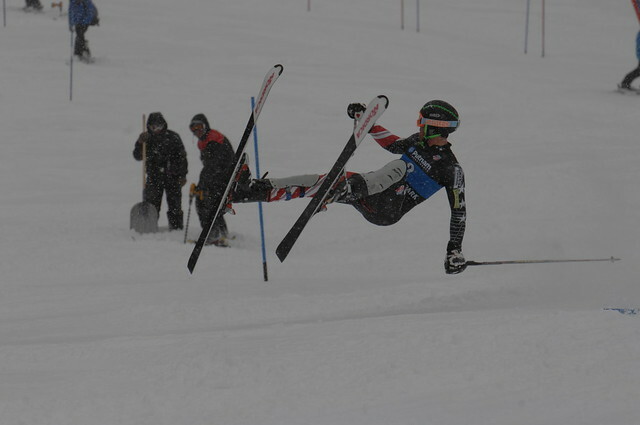 David Chodounsky also uses a variety of apparel to protect his shins from the assault of ski gates. As an Olympic caliber slalomer, your shins can take a beating after a tough day on the slopes, which is why he uses Slytech Assault Racing shin guards and SmartWool PHD Light Ski Socks. The socks provide exceptional warmth under a thin façade and the shin guards protect the lower half of your legs from being torn up while you tear up the slopes. Discover all the skis, skiwear, ski jackets, and other hardware David Chodounsky uses below!